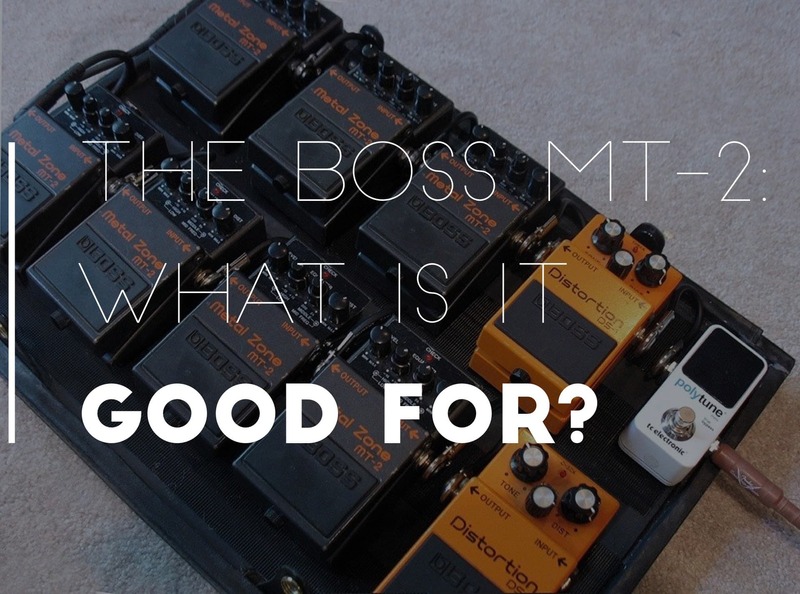 The Boss Metal Zone MT-2 is one of the most controversial guitar effects ever made. It was introduced in 1991 and remains one of Boss’s top sellers (if you search “metal distortion pedal” on Amazon, it’s the top result). Despite the popularity, the Boss Metal Zone is potentially the most bad-mouthed pedal in history. Why is it so popular, why is it so hated, and does it deserve a place on your board? Let’s take a look. From left to right, the Boss Metal Zone MT-2 features a master volume, a pair of concentric equalization knobs, and a distortion control. The volume control simply controls the output level of the pedal. The first concentric pair of knobs control the high and low frequencies, and the second pair is a semi-parametric midrange control that gives you a lot of boost or cut centered anywhere from 200hz all the way up to 5K. The distortion control is probably the most appealing, and starts around eleven and goes up to somewhere near infinity. Aside from that, the pedal has an input and output jack, a 9V input, and uses buffered bypass switching. It actually packs a lot of functionality into an intuitive and uncluttered layout, and it comes in the tried-and-true standard Boss housing. Add to that the black metal flake finish and orange lettering, and you’ve got one metal-looking pedal. It is…not good. It seems to compress a lot very early, which feels unnatural. It is also a noisy pedal. It produces so much hiss that a noise gate is essentially required if you desire to keep your sanity. Despite the power of the midrange control, the Boss Metal Zone always seems to be either too muddy or too harsh, with no real sweat spot in between. Surprisingly, dropping the distortion to the lower end of the spectrum and cranking up the low mids yields a pretty good classic rock/cranked Marshall tone, but that’s not what most people would call metal. Getting the pedal up into the higher ranges of distortion, however, brings about a sound which is, at best, difficult to harness. Instead of the “liquid” voice that is often ascribed to high-gain guitar tones, the Metal Zone has an abrasive treble character that is very hard to get away from. Turning down the treble just removes what articulation there is and turns the sound into a boomy, muddy mess. Adding more midrange helps cure the articulation problems but with high levels of distortion you have to add so much that the sound returns to harsh. If you should happen to find just the right sweet spot of pleasingly scooped but not harsh, you will probably have an OK time right up until your guitar has to cut through a mix. The scooped character and compression will keep your guitar buried under the drums, bass, and the other guitar player who has a decent amp. Despite its name, the best sounds available from the Metal Zone are more classic rock than metal. So Who Uses the MT-2 and Why is it Popular? Basically every metal kid ever. If you’re 14 and don’t know anything about gear and couldn’t afford any of it even if you did, walking up to the Boss display at Guitar Center is the most accessible way to try different tones. It even says “Metal” right on the pedal—can you beat that? The appeal that the Metal Zone has, sonically, is that it’s loud, naturally scooped, and compressed. It makes it easy to play fast and get pinch harmonics and the noise hides mistakes well. Plugged into the clean channel of a cheap practice amp, the Boss Metal Zone makes your guitar sound way more massive than the wimpy distortion channel ever did. It’s also not too expensive, which makes it appealing for Christmas presents and shoestring budgets. Does the Boss Metal Zone belong on my Board? Well, if you try one out and it speaks to you, go ahead and get it; it’s your tone and you should trust your own ears above any article you see on the internet. Used examples are plentiful and can be had for around $40. A better use of it might be giving it to your niece or nephew in middle school who wants to learn some old Slayer riffs and doesn’t like the dirty channel on their 30-watt solid state starter amp. Because that’s really the strength of the Boss Metal Zone: it’s a bedroom pedal for the growing player. It doesn’t sound like a cranked 5150, but it costs less than $100 and will make pretty much any amp sound metal enough for bedroom jams. Dial the distortion knob down to pretty low and couple it with a low gain setting on your amp' to get some grit but retain a wider range of loudness from how hard you pick the strings.